Why would you participate in your dance recital? I will tell you why. It are different times: When I was a little Anne-Marie, it was just given that you would participate in the recital of your balletschool. You worked to it all year; obviously, you are going to dance on stage together with your ballet friends! However, nowadays it is not so obvious. Personally, I think that is a shame. It is becoming more and more difficult to let a dance student commit to a whole season of dancing. Because they have so many choices in hobbies and things to do. The recital used to be a reward for your hard work. But for some, this is not enough anymore. Then why would you participate in your recital? Not only for your child, but also for yourself, should you have the opportunity to dance in a theatre. Reason number 1: Finish what you started. Firstly, a child learns that when you start something, you should finish it. After putting in the hard work, you will have a rewarding end. Self-discipline and perseverance, that is what a child learns from this. Don’t get me wrong, if a child really does not enjoy dance, and does not want to go to class, then it should stop. Because it will be a waste of time and money. And fun in dancing is the most important thing! However, you need to have the patience and accept that practicing to become better is a natural process. Even moments of frustration, when learning a new skill are normal. And you will be so happy and proud when you finally succeed. It is a learning process, with many short learning processes. A recital is a perfect moment to show off all you have learned. Reason number 2: You are going to put up a great show with your ballet friends. Secondly, children learn they are part of a group and working towards a common goal. This is excellent for the childs social development. Learning how to trust, have faith, talk and cooperate. When you just leave, the group will fee, and rightly so, abandoned. Integrating in a group is also necessary for adult life. And group activities, as participating in a recital, will cultivate and stimulate to do so, from a young age. Reason number 3: You will see that you are part of a bigger thing. Thirdly, at a recital all the groups and dancers of the school will participate. I remember the ‘oohs’ and ‘ahs’ from students and helping moms when they saw all the groups at the dress rehearsal. I was not only part of my own group, but a part of the whole show. This was awesome to experience! Reason number 4: A victory in independence. A day at the theatre can be overwhelming. For young and old. I even see adults being impressed by what they see in the theatre. Mostly, that moment will be in between the wings at the dress rehearsal. As a child you go in with your group and help moms to go get ready: makeup, costume, dress rehearsal. And in between, there is waiting and looking around. You feel a lot of (new) emotions: excitement, enthusiasm, fear, pleasure. For some, it can be overwhelming. But what a victory when you are standing on that stage at the end of the day. And dancing that finale altogether. You can be really proud of yourself. And as a parent, you are obviously proud of your child. There. Now go on and practice and enjoy the whole experience. And dance your heart out on that stage. Have fun! 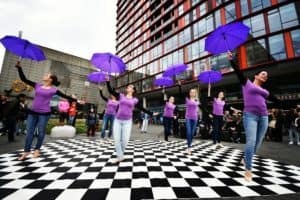 Compagnie Violetta performing at the IDDFestival in Rotterdam. Next: Next post: Ideas for extra revenue for your studio.